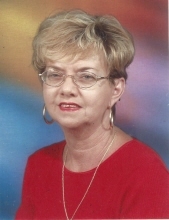 Relatives and friends are advised of the passing of Irene Richardson who passed away on August 21, 2018 at the age of 68 in Florida. Irene was preceded in death by her parents Edward and Gertrude Magras. She survived by her brothers Clement “Tony” Magras and Franklin “Frankie” Magras; husband Henry Richardson, daughter Cindy Richardson, son Jay Richardson, daughter-in- law Victoria Richardson; grandchildren C’Anne and Tyra Hunt, Jacob Richardson and Paige Christoffers; many nephews and nieces, cousins, and special friends too numerous to mention. Relatives and friends are respectfully invited to attend funeral service that will be held on Thursday, September 6, 2018. Viewing will be held from 8:00am – 9:30 am at Celestial Chapel of Hurley Funeral Home with services following at 10 am at St. Anne’s Chapel in Frenchtown. To plant a tree in memory of Irene V. Richardson, please visit our Tribute Store. "Email Address" would like to share the life celebration of Irene V. Richardson. Click on the "link" to go to share a favorite memory or leave a condolence message for the family.